This morning we heard the sad news that the 68-year old man assaulted on Monday night in London’s riots had succumbed to his injuries and died. Apparently he had been trying to extinguish a fire set in a bin outside theArcadia shopping centre in Ealing, westLondon. 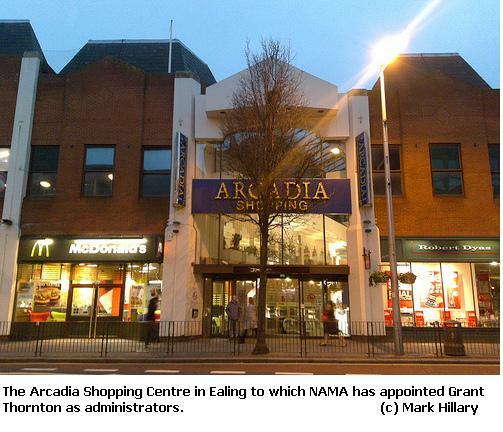 The Arcadia itself suffered light damage in Monday night’s riots. It is a property to which NAMA appointed administrators in May 2011 after differences arose between NAMA and the original owners, the Grehan brothers, Ray and Danny. It is the smaller of two shopping centres in Ealing, the other being the Ealing Broadway shopping centre. NAMA has not announced its intentions with the centre though it was reported that the Grehans were assembling a syndicate to bid for it. Today sees the publication of the UK July 2011 IPD Monthly Property Index – the index covering UK commercial property up to the end of July 2011. The IPD (Investment Property Database) index is the only UK commercial index referenced by NAMA’s Long Term Economic Value Regulations (Schedule 2) and is used to help calculate the performance of NAMA’s “key markets data” shown at the top of this page. The Index shows that capital values are still increasing but at a modest rate compared with the end of 2009/start of 2010. The Index rose by 0.1% in July 2011 compared with June 2011. Overall since NAMA’s Valuation Date of 30th November, 2009 prices have increased by 11.3%. Commercial prices in the UK are now 34.3% off their peak in June 2007. On an annual basis prices are up by 1.9%. The NWL index is now at 856 which means that NAMA needs to see a blended increase of 16.8% in property prices across its portfolio to break even at a gross profit level (taking into account the fact that subordinated bonds will not need be honoured if NAMA makes a loss). Yesterday, the UK Chancellor of the Exchequer Tipperary/Waterford man (or least his family hailed from those parts) George Osborne boldly claimed that the UK was a haven in a sea of economic turmoil, after the S&P downgrade of US debt from AAA to AA+ and after the recent bout of jitters in the EuroZone. Gung-ho George’s assessment came just a day after the Bank of England issued its latest Inflation Report which was accompanied by a more cautious projection for the UK with GDP seen as growing by 1.4% in 2011 (down from 1.8% previously) and inflation remaining high at 5% in 2011 before dropping to 2% in future years. The outlook appears to show modest general growth in the economy and asset prices. NAMA is beginning to notch up quite a number of sales, some of which have been disclosed by NAMA, others reported in the media and there’s a good chance that there have been sales which have not been disclosed at all. This entry brings us up to date on reported sales, that is sales in the public domain. Sales information will be regularly updated – in the format below which shows the property followed by the reported developer or main developer, the buyer where known, the reported sales price and the date of the report of the sale – under the NAMA property for sale tab above. ** NAMA’s involvement with the reported sale of loans has not been confirmed. Figures released by the Central Bank of Ireland (CBI) this morning show that the elevated reliance by Irish banks on funding from the CBI and the ECB declined by €4.1bn in July 2011. The figures show that ECB funding to Irish banks at the end of July 2011 stood at €97.6bn, down €5.4bn in June. 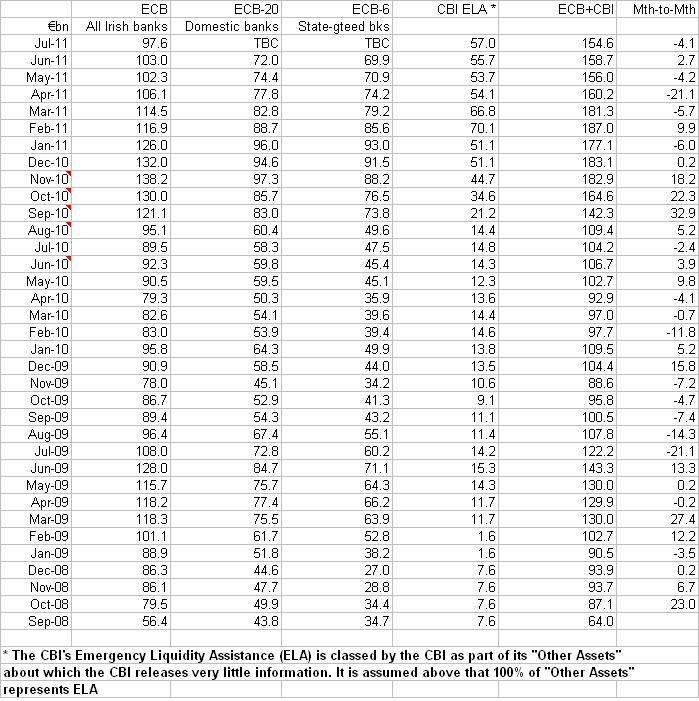 Funding from the CBI, understood to be mostly Emergency Lending Assistance (ELA) rose by €1.3bn from €55.7bn to €57bn. The figures overall point to a lessening reliance on central bank funding and will generally be greeted as good news. There is an implication that deposit levels may have stabilised further or that other sources of funding, for example investment or sale of assets, have materialised to replace a deposit flight that has been ongoing for over a year. Of course it was 21st July, 2011 when the EU summit concluded with a commitment to future funding of eligible countries as well as an interest rate reduction on our sovereign bailout funds – all in all, the summit agreement should have boosted confidence inIrelandand by extension Irish banks. It will be the end of August 2011 when we get to see how deposits in Irish banks fared in July 2011. So the figures released this morning are only indicative of a slight strengthening in the funding position of Irish banks. And before we get carried away, the fall was just €4.1bn in the month – and in May 2011 there was a €4.2bn decline only to be followed by an increase in June 2011 – and we are still at the level of funding provided in October 2010. It’s been long recognised that there are winners and losers in the present downturn/recession/depression; whilst the majority of the population is suffering from reduced employment, unemployment, lower gross wages, higher taxes, some sectors have been doing okay, the old defensives like the public sector for example and the so-called sheltered professions of doctors, lawyers, pharmacists. Some sectors are booming, receivership obviously, but property asset management is coming of age in the country as well. NAMA is the biggest specialist property asset manager operating in the country, though arguably all of the banks are managing their loan assets and seeking to maximise the value of those loans against the backdrop of a property market that has tanked – 64% down from peak for commercial real estate, 30-60%+ for residential property depending on what source you consult and 75-90%+ for development land. With such a collapse in property values, many loans are inevitably distressed and require “active management” so as to avoid fire sales. After NAMA which has to manage loans of €73bn at par value – for which it paid €31bn – is Certus the asset management company initially set up to manage loans left behind by the Lloyds banking group, or more specifically the local brands within that group of Bank of Scotland (Ireland) and the Halifax. Certus is understood to be managing some €27bn of loans. Lloyds seems to have been acting as a pathfinder in seeking current price discovery in the present Irish market through high profile sales through the two Allsop/Space auctions. Lloyds itself however is also managing a residue of Irish commercial real estate loans and Property Week today reports that it has engaged Green Property Group to manage a portfolio of (presumably foreclosed) property. A figure of €1bn is cited by Property Week but it is not clear what this exactly represents. Nor is it clear what specific assets will be managed by Green, though Property Week does refer to “retail, office and industrial assets”. Last year Green announced a tie-up with US investment group, David Bonderman’s TPG Capital which was said at the time would make available nearly €1bn for investment purposes. Green was subsequently at an advanced stage of negotiations to acquire the €100m+ Royal Liver portfolio of properties in central Dublin late last year when negotiations broke down, apparently as a result of the IMF bailout of the country. In 2009, Green acquired a major portfolio of property from AIB following the uncovering of a fraud in loans that AIB had previously advanced to Achilleas Kallakis. Green Property was established in 1965. The company engages in property investment and development. It was floated in 1985 and listed on both the Dublin & London Stock Exchanges. In 1993 the company had a market capitalisation of only €10m. In 2002 the company was taken private in a management buyout led by Englishman, Stephen Vernon and backed by Merrill Lynch and Bank of Scotland. At the time of the buyout the market capitalisation was over €1bn. Pat Gunne is its present managing director. Its most prominent asset inIrelandis Blanchardstown Town Centre shopping precinct. According to Property Week, “It is expected that retail, office and industrial assets will all fall under Green’s “active asset management” remit to “to improve the assets’ cashflow, improve rental levels and maximise sale proceeds in the medium term”” That sector of the economy devoted to improving asset cashflow, rental levels and maximizing sale proceeds in the medium term is set to become quite crowded, especially as NAMA begins its own “active asset management”.